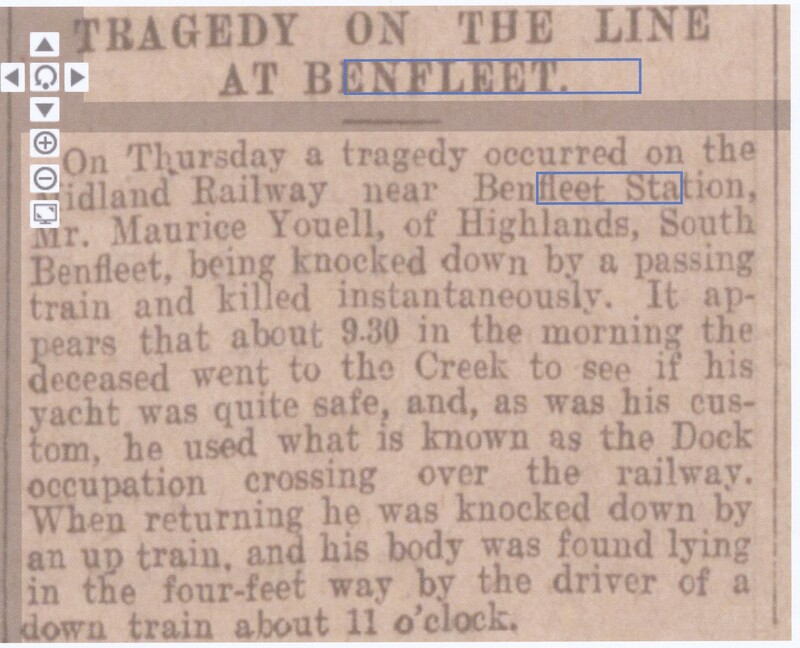 Both the Essex Newsman and the Chelmsford Chronicle covered the sad tale of the keen yachtsman who was run over by a train near to Benfleet station. Both accounts (see below) agree on the basic facts, but differ greatly in the detail …. A simple example being the spelling of the deceased’s surname…Youel or Youell. The reason for this can be found in the publication dates ….. The Essex Newsman published 14th February 1914 and the Chelmsford Chronicle 20th February 1914 ….one before the inquest and one after is the simple explanation. Granted he was known to have eyesight problems, but as to how you can be unaware of a train approaching unless you are also deaf is mystifying. I do not recollect steam trains pulling quietly into a station. On another tack perhaps there are railway buffs out there who can explain the terms “Dock occupation crossing” and “four foot way”. 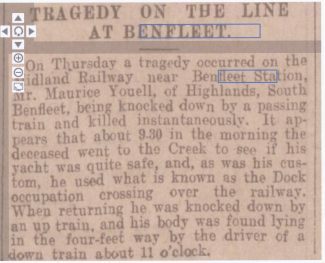 Mr C. E. Lewis held an inquest at South Benfleet on Saturday on Edward Frederick Maurice Youel, 46, of independent means, of Highlands, South Benfleet, whose mutilated body was found on the Midland Railway near Benfleet station. Commander S. B. Youel RN of Alverstoke, Hampshire said the deceased, his brother, was formerly on the Stock Exchange. Deceased had suffered a little from insomnia. He was very keen on yachting. Arthur J. Eldridge, fruit grower, Highlands, South Benfleet, said deceased had been staying with him as a paying guest for 15 months on and off. He had a yacht in the creek and used to spend a great deal of time with it. On Thursday he left the house to see the yacht and would have to cross the line to get to it. Deceased had stated that his sight was not so good as it used to be and that he would have to wear glasses. P.C. Monk said deceased was apparently knocked down about a yard from the crossing. H. Wilson, permanent way inspector, said that on the arrival of the train he saw a cap sticking to the buffer of the engine. Report in the Chelmsford Chronicle Friday 20th February 1914. Re: Railway tragedy at Benfleet. The term four foot refers to the gap between the rails that forms the single track. (actually it is four foot eight and a half inches but is commonly called the “four foot”). The gap between two adjacent running tracks at six feet is commonly called the six foot. Whereas the gap between a running track and a siding would variously be referred to as the eight foot or the ten foot. You get the idea by now I’m sure.